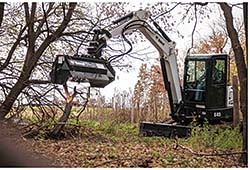 The mower's excavator attachments are designed to cut tall strands of thick grass, bush, vines and small trees in ditches, and on hillsides and riverbanks. The attachments also assist with maintenance at parks and on trails. The 30-inch mower attachment is designed for use with E32 and E35 excavators with hydraulic flows of 12-20.7 gallons per minute (gpm). The 40-inch attachment is designed for the E42, E45, E50, and E55 excavators with hydraulic flows of 14-24.1 gpm.